Not long after Reuters reported that Starbucks is being "sued for squashing competitors," comes the news that the coffee (and a little bit of tea) giant's long-term goal is 40,000 stores. 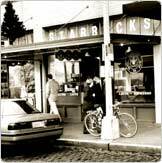 Starbucks currently has 12,000 stores. The fact that I can't understand why Starbucks needs so many stores probably renders me unfit for the high-falutin' world of big business. This news appeared in numerous media outlets. Read what the International Herald Tribune had to say here. If you feel that green tea's been getting all the press, at the expense of black and others, you'll be happy to read this report from Web MD and CBS News. If it's to be believed, black tea has considerable health benefits too. I don't see the connection between black tea and stress reduction. Whenever I drink it - which is often - I tend to feel rather keyed up. But what do I know? Last, but not least, I'd like to mention a new project I'm rolling out. It's called Weird Eats and it's a Web site created to take a look at...well - weird eats. It's only been around for a week or so, but there's plenty more to come. Have a look here and tell all your friends. Got chocolate flavored tea from Adagio, it's so amazing.